How Many Lap Steels Do You Own? I have 2 six string lap steels. Neither is really anything special but I enjoy playing them. I think everyone has reasons for having multiple such as experimenting with tunings. I keep C6th on my long scale and on my short scale I change from C6th to a few other tunings when I wanna try something different. Lap steels are like Lay's potato chips. When it got to twelve I had to impose a one-in, one-out policy. Dual neck consoles still just count as one guitar though. Chandler RH-2, Asher Electro Hawaiian Jr. and a Gretsch resonator. Lots of stringy things, many of them slidey. At least five electric and nearly the same acoustic/resonators, your right I should have more!!! It changes from day to day, but currently, 4 electric steels, 5 dobros. 6 Steels 4 I built m self and 3 reresonoators One is a 10 String Dobo. 3 double-eight consoles, and 2 laps. I'm sure another will appear by the end of the year. I hang the laps up...looks cool. Oh boy...I voted 3-5 and then immediately realized I'd miscounted. 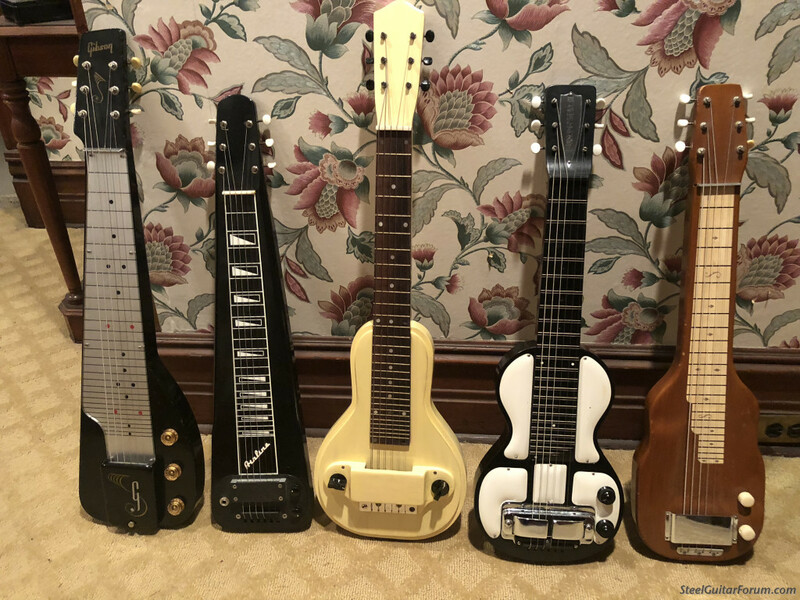 I have a little bit of "redundancy"...my very first lap steel (absurdly short scale Morrell student model) I almost never play unless I need a guitar I can fit into a suitcase diagonally to fly with. And my Mag doubleneck and Stringmaster triple are a bit redundant practically. But the tricone and the 8 string SX lap each get played a lot too...one as the acoustic guitar, the other as the portable version of my consoles, and the Fender 400 is completely its own thing (maybe it doesn't count as a lap steel admittedly). I would say after an initial frenzy of guitar acquisition I'm pretty happy with my guitars and don't find myself trawling reverb.com or the for sale selection like I did before. A dozen plus...and my wife bought the D-6 Stringmaster for me as a Christmas gift. She is fine with my collection. I am a lucky man. Posted 6 Apr 2019 10:51 am Lap steels. Two 8 string, and one 10 string. Only gig with the 10 string. I have 5 six strings, one husk waiting to be restored, and 3 builds going on. I just have one lap steel, but I have a double neck console. I had a few at one time, but I kept the one I played the most. I wish I'd kept a couple of them.